Netbook, Notebook, Laptop... What's in a name? By now, we have a pretty good idea about what the difference between a netbook and a notebook is, but is there really a difference between a laptop, a notebook, and an ultralarge? Before there was anything that could remotely be called a laptop or notebook, there were the "luggables," heavy, non-IBM compatible machines that ran some version of the operating system,CP/M, that came before MS and PC-DOS. At top in the image at left is the Xerox NoteTaker. This prototype machine of 1976 was never manufactured, but it was the first of the luggable computers and it set the standard for the early portables that would follow. The NoteTaker may have also been the first computer product to use a name made of two words smushed together, which is now rampant in the field of personal computers, programs, and accessories. The machine in the middle is the aluminum-cased, 27-lb Kaypro II circa 1982. This was the first portable "personal" computer I ever saw and touched, and it was portable once - it moved into the small office and there it remained, open and ready, until its retirement some years later. The lower machine is an Osbourne 1, a 22.5-lb microcomputer with a 5-inch screen. Notably, it used a version of Smalltalk as its operating system. 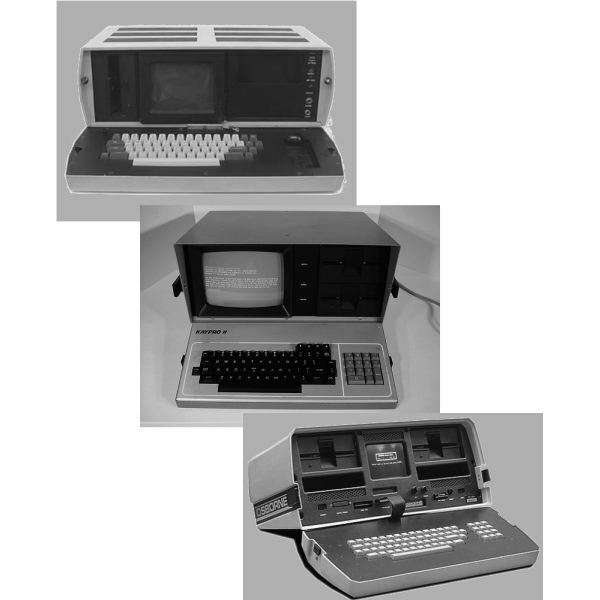 It was also the first microcomputer that could run business applications, among these WordStar, SuperCalc, and, a little later, the dBase database programming manager and language. At this time there were also dedicated word processors that were essentially keyboards mounted atop logic boards with a small LCD screen that could display a few lines of text. The Epson HX-20 managed to have a multi-line display, electronic calculator printer, and microcassette storage all in a package with the footprint of an A4 sheet. It also came with a gray, typewriter-like cover. Enthusiasts claim that the HX-20 was somehow both the first notebook and the first handheld computer. For our purposes, it was another step toward what we'd call a notebook PC today, but I wouldn't call it either a notebook or a laptop. A conventional clam-shell laptop also appeared in 1982. Called the "GRiD Compass," it was expensive ($8000+) and was only used by NASA and the US military in various roles. It was also the first independent computer to fly aboard the Space Shuttle. About a year after the GRiD was introduced, the Galivan SC, another semi-clamshell device in which the screen folded down over the keyboard was launched. These were not true full clamshells because the screens did not cover the entire base. The Galivan SC was the first portable computer marketed as a "laptop," and there we have our first definition: a laptop is a computer than can sit in one's lap. Here's Webopedia's definition: (n.) A small, portable computer -- small enough that it can sit on your lap. Nowadays, laptop computers are more frequently called notebook computers, though technically laptops are somewhat larger in size than notebooks in both thickness and weight. IBM's policy was to call their ThinkPad notebooks rather than laptops because they expressly did not want customers to place them in their laps. Since I use ThinkPads, I have a tendency to think of them as notebooks, and all other such devices as laptops. Be that as it may, is there a special connotation that has arisen around the words "notebook" and "laptop?" Other than what the manufacturers choose to call their machines? Perhaps. We are now seeing some very large machines being marketed as "media center" or "studio" devices. In weight, these more closely resemble a luggable than a traditional laptop or notebook, and they are seldom referred to as notebooks at all. Too, there's a class of very small notebooks called the subnotebooks that tend to have 13-inch screens and smaller and then the ultraportable notebooks that eschew even optical drives in their quest for lightness and mobility. Very seldom does one hear the phrases "ultraportable" and "laptop" uttered close together, and I've never heard of a "sublaptop." The design of the ThinkPads, by the way, was based on the shape and look of a black lacquered Japanese lunch box called a Shōkadō bentō. It was about the thickness of a good book. Maybe we should crowdsource the question. Taking as supposition that laptops and notebooks are whatever the majority of people think they are, let's look at which phrase is searched for more at Google. In the image below, "notebook" is shown in blue, "laptop" in red, and "netbook" in orange. 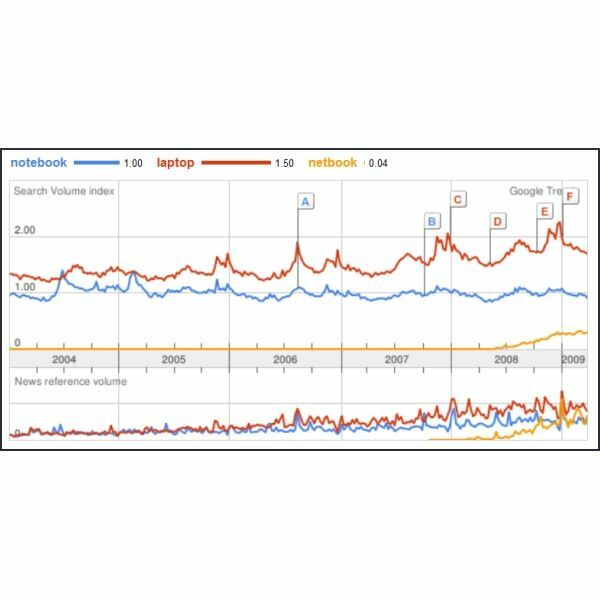 Notice how netbook just sort of showed up in the results in news references in late 2007 and then took off measurably in general searches in 2008, merging, it seems, with notebooks in newsworthiness. (That certainly seems to be the effect here at Bright Hub, too.) More than half-again as many people use the term "laptop" in search phrases than use the term "notebook." So what have we learned here? If we take it that the terms notebook and laptop are now virtually interchangeable, we can also say that laptop is beginning to be a more popular term, except, that is, in the smaller form factors of subnotebooks and ultraportable notebooks. (People may look at you oddly if you try the phrase "ultraportable laptop.") Formerly it was thought that the break between notebooks and laptops occurred somewhere around a 13-inch screen size, but the advent of the wide screens has obscured this distinction. We now have 15+ inch notebooks that are compact, light, and thin.